I have an excuse for not posting for awhile. We escaped for a long weekend with family members at a cabin in the pines near beautiful Wallowa Lake. The cabin had lots of rustic and charming touches, including furnishings like this chair and table on the deck that were echoes of bygone times. Our time was spent soaking up the mountain scenery; relaxing in lawn chairs or hammock; toasting marshmallows by an open fire; throwing darts and playing board games. We capped it off with a day hike into the rugged Eagle Cap Wilderness. love the painting, it is as though you entered another space in time and thanks for sharing a little of your trip:)r.
Hi Rahina--thanks. Yes, it did feel kind of like a retro experience at the cabin--like going back to the fifties, or even earlier. Fun. LOVE this! When I was growing up, we owned a rustic resort in the Sierra Nevada and had chairs just like this in front of our store (although they were green). They survived for decades, lovingly repaired and repainted as time passed. Thanks for the trip down memory lane! Don - red chair, yes!!! Great stuff. And the video - well I am happy you guys enjoyed yourself but for me the star of the show has to be Winslow. What a super dog he has turned out to be. It was great to see him acting out his sailor role there! Thanks a lot, Leslie--glad this triggered some good memories. Yes, those chairs were everywhere in the 50's and 60's. They really are quite beautiful, classic designs. Thanks, Sheila. Winslow is definitely the star--we have so much fun with him, even if he drives us nuts sometimes. He's a good-hearted little soul. hee hee! great video!!! winslow is verrry cute! great painting, too - LOVe the RED! Wonderful. I feel like I'm there. 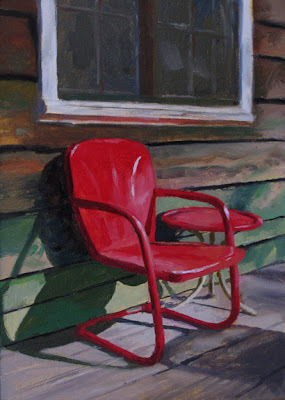 So evocative of a lazy summer day at the cabin. Hi Martha--thanks! Yes, Winslow keeps us in stitches. It's like having a 3 year old again--but it's worth it. Congrats on your terrific show. Thank you, Carolyn, I appreciate hearing from you.